When it comes to outdoor entertaining, most of us want to be outside, where the party is. But when you’re on kitchen duty, you can’t exactly get out and enjoy the fine weather and company. That leaves you either stuck all alone or running back and forth all night. And neither of those makes for the best party atmosphere. Unless you take the kitchen with you, that is! An outdoor kitchen island lets you do all the prep work outside, while you exchange pleasantries with your guests. Usually they consist of an island fitted with a stainless steel grill, possibly with a pizza oven or hearth nearby for outdoor baking. While not a simple project, per se, an experienced DIYer will have no trouble building one in a weekend. Read on to find out what you need to know to get started. Will You Need Plumbing, Electricity and Gas Lines? A killer burger recipe requires different cookery than a smoked rib, obviously. Before jumping into a DIY project full-swing, it helps to decide exactly what you need. 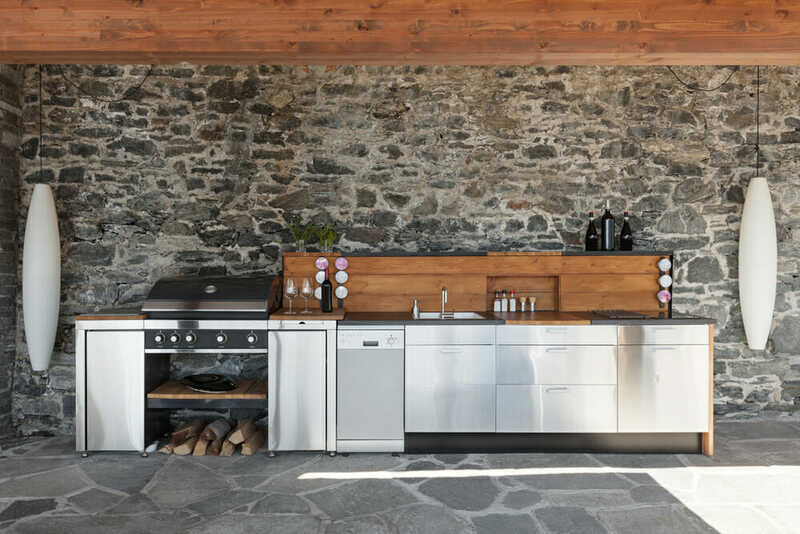 Most homeowners feel completely satisfied with a wood-framed kitchen island outfitted with cabinets, a mini-fridge, and a rolling gas-powered grill. To protect the cabinets and grill, and give the whole piece a finished effect, they often apply a faux stone veneer using a scratch coat of mortar and wire spread over plywood sheathing. That’s just the basic model, of course. Many homeowners choose to additionally construct their own wood-fired ovens, or even install an outdoor supply line and full kitchen sink. Or they add a chimenea, built-in stove, or even an alcove for a standing charcoal grill or large smoker. Or they may have a second island angled off the first to create a luxury kitchen affect. It all depends upon how often you cook—and how much you detest bringing things out from your indoor kitchen before you get started. If you’re serious about your barbecue, you may find you need quite a bit of storage, particularly if you run out of room for larger cuts of meat in your refrigerator. There’s no two ways about it: adding outlets for a refrigerator and plumbing supply lines for a sink will significantly increase the project’s complexity. Still, if your kitchen area has a cover, and if you plan on cooking outdoors fairly frequently, it may be worth the extra effort in the long run. It sounds simple enough to get by without a sink in the abstract, but in practice, it means a lot of messy clean up that could be avoided with outdoor access. To simplify the project, skip the hot water lines and run just cold water outdoors. That way, you don’t have to insulate the pipes. And if you do hope to use your kitchen year round, task lighting installed in the area can make the job a lot more comfortable when the days get shorter. You’ll also probably want a few outlets for appliances, as well. However, if you decide to run electric, gas lines, or plumbing outside, plan on hiring a qualified contractor for this part of the job. In particular, if you want to add electrical lines, you’ll typically need to set up a separate ground fault circuit interrupted circuit board outside your home. Additionally, you can also choose to install natural gas lines to fuel your gas-powered grill, in place of individual propane tanks. That will add somewhere between $500 to $600 to your project. All of these require specialized knowledge that can make it difficult for a homeowner to complete by themselves. And the outdoor element adds additional complexity, since you’ll need to protect lines and outlets from the elements. Your contractor can provide professional advice for how to do this safely. Even if your kitchen will go in a sheltered or covered area, you’ll still want to consider the sturdiness of your surfaces. Particularly, look for stainless steel cabinets that won’t rust or degrade throughout a variety of weather conditions. Opt for models with welded corners to prevent leaks and condensation. If you don’t particularly like the look of steel, you can also go with teak or marine-grade polymer cabinets as well. Make sure you properly seal the wooden frame with mortar to keep it from rotting over time. Water-resistant counter-top materials like stone, concrete and tile make some of the better options here. If you don’t have a cover, pergola, or other shelter on your deck or patio, invest in a retractable awning or other shade to partially protect the kitchen from inclement weather—especially if you have gas, outlets, and electrical lines in the area. That way, you’ll stay safe while cooking up the world’s best burger. 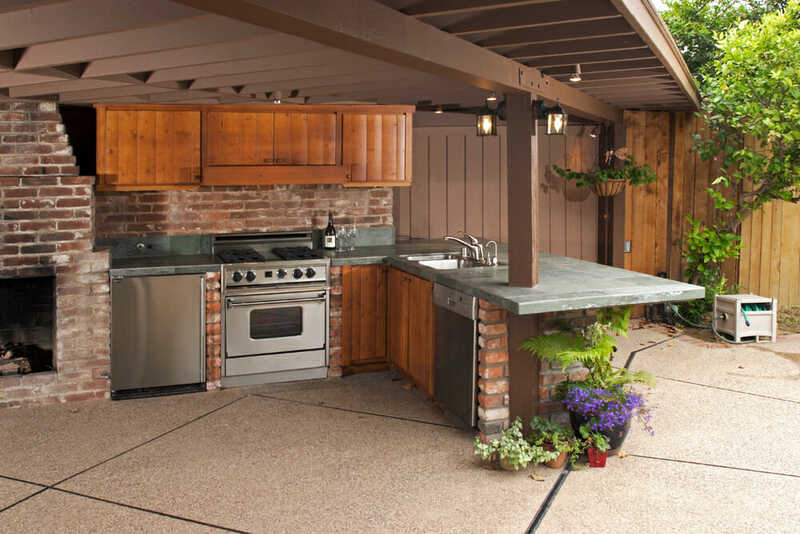 An outdoor kitchen: party perfection made easy!